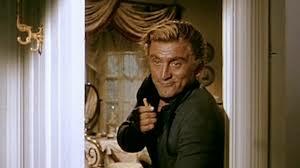 Today is the 101st birthday of Kirk Douglas, one of Hollywood’s great leading men. To celebrate this day, I decided to look for words of wisdom in his movies. He starred in many films, but, under the established rules, the quotes must come from movies that I have seen. If you have other favorites please let me know. Without further adieu, here are some wise words from the movies of Kirk Douglas. I’ve yet to see the day you can make a deal with a mad dog. Twirlin’ a gun never saved a man’s life. Lies will not sustain a tyrant. Love and hate are two horns on the same goat. Always take the long view. Taste is not the same as appetite. On the most exalted throne in the world, we are seated on nothing but our own arse. The world needs more simple understanding to bring people together. There’s more to life than death.